Scientific communication: blogging and publishing? "My original intent in writing this post was to compare the 5 most-cited papers on biodiversity to the 5 most blogged-about papers on biodiversity to address the differences between what we value as researchers versus what we value as general science communicators." What struck me throughout this post was this, maybe implicit, need to distinguish between blogging and publications. I always approach a publication as a communication of ideas. Depending on the research and journal, these ideas can be very specific or more general, and hopefully I will tailor my writing to these different audiences. And blogging is just another communication channel, with its own specific type of writing associated with it. However, I also think that the similarity between blogging and publishing goes deeper than the intent. Jeremy Fox (I know, he just keeps putting ideas in my head) compares blogging basically to conference meetings. While I agree with the usefulness of this analogy, I think blogging goes deeper than that. Isn't our ancient publication system a prototype of blogging, with references serving the double role of url links and comments/replys? Our old system is surely slower, but both systems even use the same philosophy to measure "importance": pageranks for blogging and #references/citation index for papers (and more sophisticated methods such as this paper, mentioned in a different context here). "Beside these major problems, this MS suffers from a weak editing effort as suggested by the numerous errors found (e.g., several errors in the literature cited in text and the reference list, poor quality of figures without any explicit legends, redundancy in the method, result and discussion sections). I warmly recommend the authors to thoroughly revise their MS accordingly. To summarize, I suggest the authors to deeply reconsider the general framework of their study by clarifying its novelty and scope, to increase their pedagogical effort, to remove the meta-analysis, and to be more careful while editing their MS."
Auch. Auw. "Warmly". And we probably all get more of these critical than glowing reviews. But s/he made a lot of valid points that will greatly improve this manuscript. So a publication is just a blog post where the commenters have some real power. Interestingly, there are some academic publishing experiments that blur this difference between blogging and publishing even further (see for instance this interview with the president of Frontiers). What is ecology, and evolution - the value of interdisciplinary collaboration? What is ecology? What is evolution? Seems like a really simple question from an ecology or evolution perspective, until you bring a different field into the mix, e.g., transposon/genome biology. When we started the TE (formerly known as genome) ecology group, sometimes in March 2010, I had no idea we would end here, with a publication in a journal with a higher impact factor than Ecology. "A strictly evolutionary approach investigates change (or the lack thereof) in some focal entity over successive generations. The focal entities can range from genes to traits or from populations to higher taxonomic units. A strictly ecological approach assumes no change in the focal entities themselves, but focuses instead on the relationships between these entities and their environment. Here we use ‘environment’ in a broad sense potentially to include any of the factors with which an entity interacts." Not exactly rocket science, you would think, but writing this publication has been an eye opener (in a positive way) to me on the importance of clear and exact definitions. I think that we have literally discussed every term we wrote in this manuscript. The predictions arose directly from our philosophical definitions and applying general ecological and evolutionary principles, the data from available genome sequences obtained and handled with bioinformatics, the actual tests from standard ecological multivariate practices. "This is a brilliantly organized and beautifully written paper that provides a closely analysed conceptual framework and strong evidential support for several key claims made by the authors. The paper draws on, clarifies and expands existing literature, and provides suggestions for how findings about the system of focus (TEs in genomes) have much broader implications and potential applications. The authors set out clearly and thoroughly a case for why transposon ecology is interesting, and are very convincing in their treatment of potential confusions and conflations. The figures are illuminating, and the results of the empirical analysis strongly supportive of all the distinctions made with such care by the earlier part of the paper. The ideas the authors develop are novel and thought-provoking, and are likely to gain a lot of attention from the biology community and beyond. I can only recommend acceptance with no changes at all, apart from a few typos to do with spaces, italicization, redundant commas, and the occasional missing ‘that’ or ‘the’. I expect this paper to be read and cited abundantly." Since this type of accolade is very rare, I decided to put it here, and thank the anonymous reviewer again (I hope s/he doesn't mind me putting it out there). This would be the perfect blurb that often comes on the dust cover of a book, and it provides a better summary and critical praise for our work. 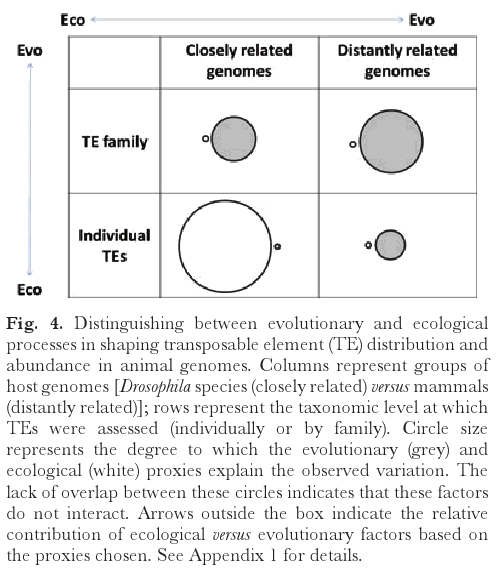 There is a lot of fascinating information in this figure, but without access to the raw data (and given my limitations due to daltonism), I get the impression that 1) ecology/biodiversity seems to be this bridge between the social and natural sciences (with Ecology, a very specialized journal in ecology, identified as a "connector[s] between various domains"), 2) philosophy is surprisingly far away from ecology. I think that our publication explicitly and successfully bridges that gap between these disciplines, and benefited greatly from collaborations with researchers from these disciplines.